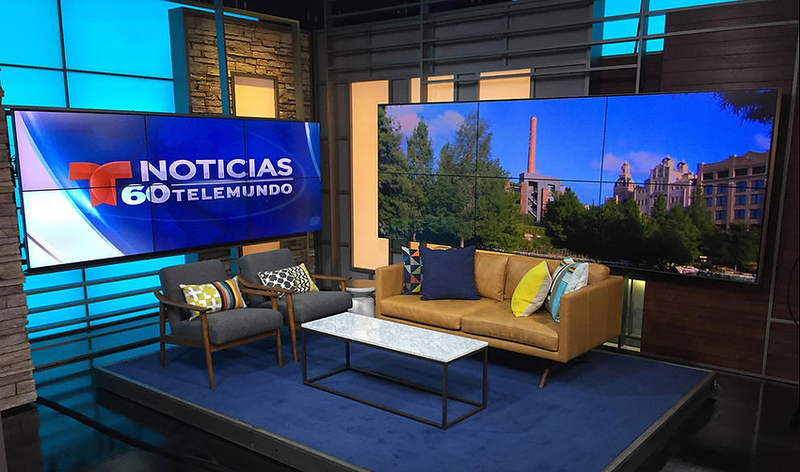 KVDA-TV, the Telemundo O&O in San Antonio, Texas, has debuted a new set that combines layered, bold rectangular shapes to create a modern and cohesive look. The new set is from John Casey Production Design and was built by blackwalnut under the supervision of project manager Frank Bradley. 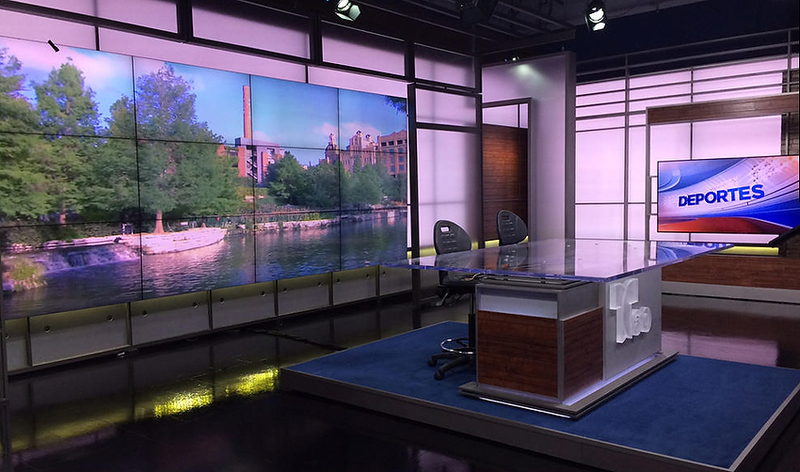 For home base, the design places a simple and solid-looking anchor desk with oversized glass top in front of a 4×3 video wall that’s surrounded by a framework of dark gray grid and frosted glass fronting the color changing background. Flanking this are two standup areas. On both sides, the monitor itself is mounted inside of a seemingly freestanding gray frame with stacked wood bands. By placing these sections in front of backlit and faux stone walls, the openings in the framework allow additional layers of set to show through, creating depth on air. 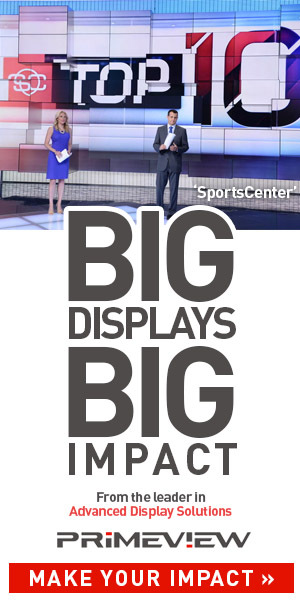 Near the top of these sections, the framework becomes narrow horizontal bands, which creates the look and feel of a header element, while still allowing for a more open, floating look.The set’s weather center is dramatically situated in the corner of two backlit walls divided into rectangular segments. In front of this wall, four monitors, placed side-by-side, meet in the intersection of the two walls. 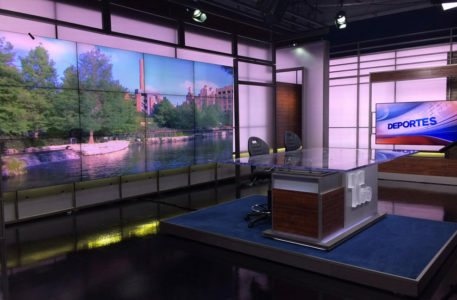 The set’s weather center is dramatically situated in the corner of two backlit walls divided into rectangular segments. In front of this wall, four monitors, placed side-by-side, meet in the intersection of the two walls. Combined, the use of these clean lines in the weather center allows the geometric theme to be carried through while also giving a different look, especially when it’s shot off-axis. 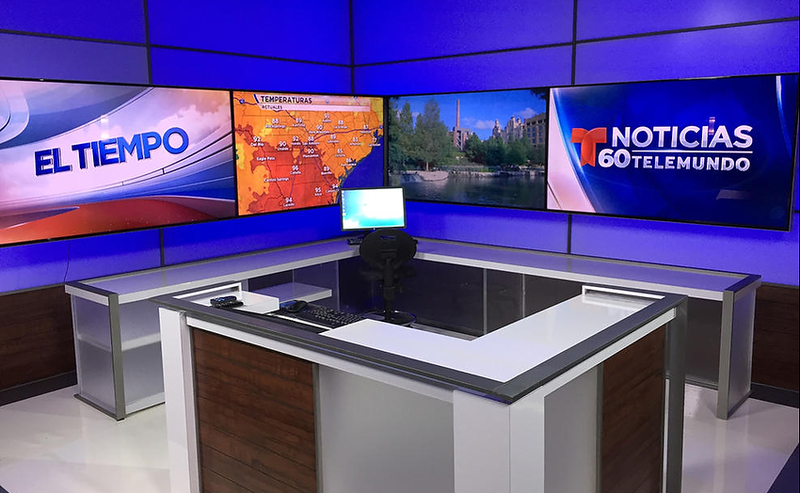 The “vanishing point” effect also serves as a perfect way to draw the eye to the center of the weather center, which also features a work area and squared-off presentation pod that matches the anchor desk. The interview area, meanwhile, includes two 3×2 video walls of differing monitor sizes. An eclectic but cohesive combination of backlit panels, gray grids, stacked stone and wood finishes give the area a more lively feel, complete with mid-century modern furniture. 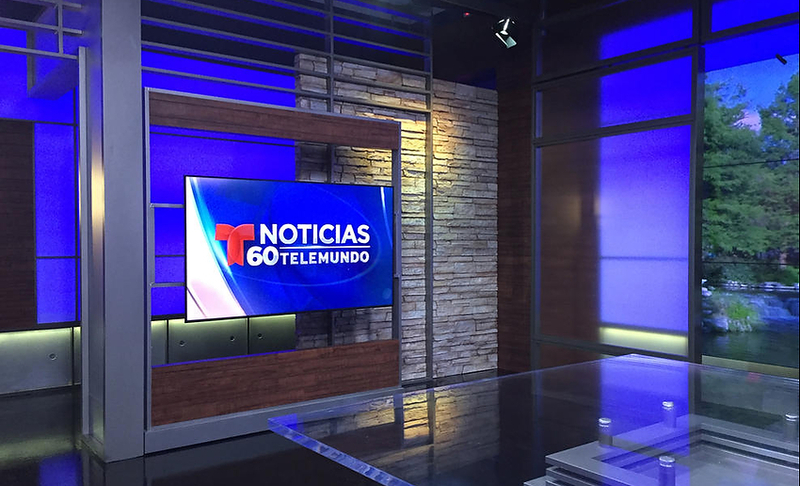 The new set comes as NBCUniversal, the parent company of Telemundo, expands its investment in its Spanish-language news operations, including a new facility that it constructed in the same state as KVDA-TV.